Except we’re not eating ribs. 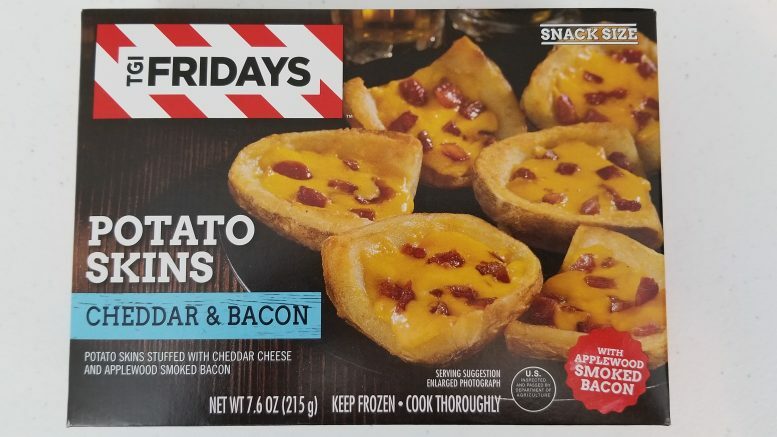 Each day, a guy named Steve from TGI Fridays takes the skin of a thousand potatoes, the wood of an apple bacon and some cheese from Wisconsin to churn out hundreds of boxes of TGI Fridays Potato Skins with Cheddar and Bacon. That or someone named Frank runs a machine that does it. Either way, the guy who started TGI Fridays just did it so he could get a girlfriend back in the 60’s. As a result of that, we’re looking today at some frozen Potato Skins with Cheddar and Bacon. Little small but all the nutrition’s there. I intentionally made the picture small this week for the nutrition facts since we’re eating potatoes with cheese and bacon. Does anything else really need to be said there? Alright, let’s take a look into those ingredients. Where do we start? Sodium acid phosphate, cellulose gum (can confirm, not as chewy as regular gum) and silicon dioxide really stood out as the most gut-eroding. Otherwise, most of the other fake ingredients look familiar from other things we’ve eaten already. The serving suggestion and enlarged photograph on the front and back of the package make these look good. Even though it says they’re stuffed with cheese, I’m not exactly sure how that works when potato skins are open the way they are. Putting “cheddar and bacon” on the front of anything frozen kind of feels like a clickbait title, you can’t not at least open the freezer and look at it. I had assumed that these could be microwaved, so the need for a conventional oven threw me a bit here. After getting it pre-heated and throwing these in for 16 minutes, it was close to a half-hour process getting them ready. That probably brought the quality and taste up a few notches. There was also this one pretty messed up potato whose cheese was spilled out next to it with the bacon spread out into the bag. If it was the 1530’s, this would’ve been the potato they kept in the attic and didn’t tell anybody about. The potato skin that the builder rejected (pre-cooking). Outside of the sketch ingredients and lengthy cooking time, these tasted really good. It’s hard to go wrong with cheese, bacon and potatoes. If someone came up and handed me a plate of these saying that they came from my local TGI Fridays, I would have believed them. That makes me wonder if they show up in a way larger quantity there. Huh. Anyhow, the potato skins and what potato was still attached to the skins tasted good. Look at ’em coming out of that oven. Thumbs up to the bacon and cheese as well. Both were good, even if brought to life by ingredients that are only kinda okay. From purely a taste standpoint, these were phenomenal. The half hour prep time and ingredients held this out of 8 range, but it was close.